When a chain breaks, we rarely look to the weight that pulled it apart – we focus on the link that failed. We blame the weakness of the chain, the one spot that couldn’t hold it all, and never question if maybe that chain was just pulling more than it should have been. This is motherhood. It was already a rough evening, not unlike most evenings. The tween was upset that I was – gasp! – making him do his school work. The 6-year-old was mad that I was busy with dinner and homework patrol and work and had my attention anywhere but solely on her. The middle kiddo was just mad at everything. And my husband was frustrated at my frustration. Again, nothing unique in this evening. No full moons, no impending holidays, no one had a sore throat. I broke away for a second to sit in silence use the restroom, and of course my youngest wasn’t far behind. I sat there, shoulders slumped, head down, just really feeling defeated. I’d been holding it in for hours, days, YEARS if we’re being honest. I started the ugly, shaking, snotty cry that doesn’t stop just because you will it to. My daughter started to cry, so I hugged her to comfort her. Note that she was standing close enough for me to hug while I was on the toilet. 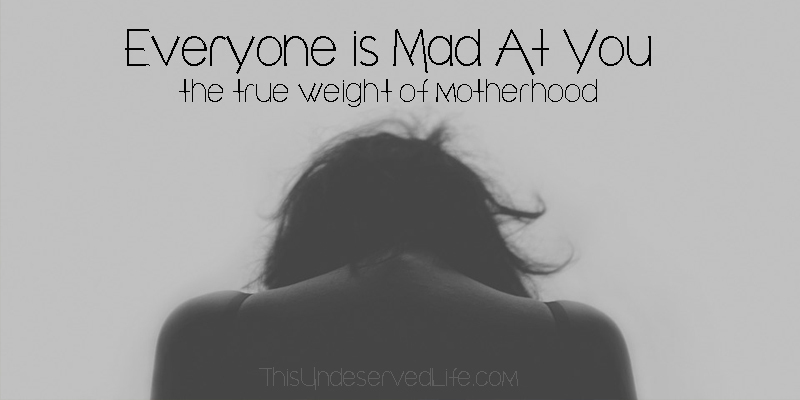 And that is the true weight of motherhood. 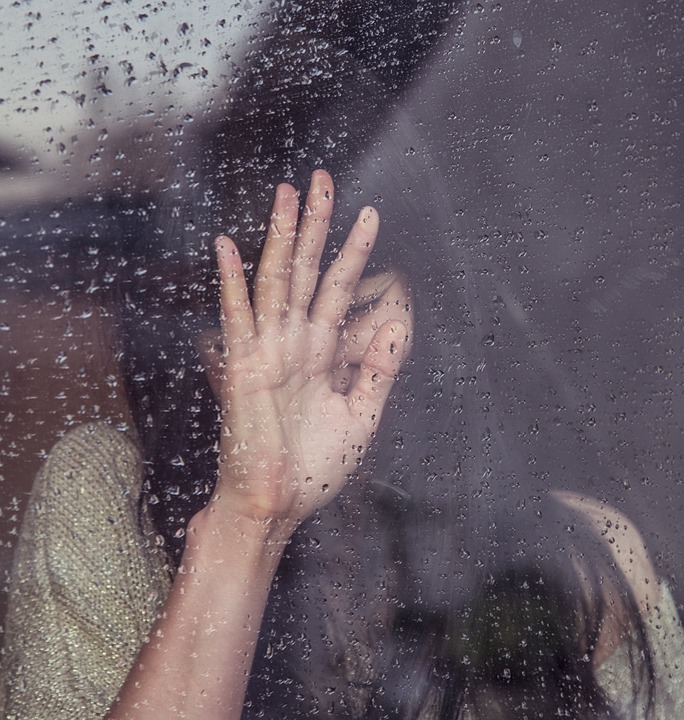 Not sagging skin, not extra pounds around the middle, not the bags under the eyes or the mounds of laundry or the piles of papers schools keep sending home – it’s the weight of everyone else’s expectations. We moms have a bad habit of comparing ourselves to others, to our own idealized selves. We hold ourselves to impossible standards and punish ourselves for not being perfect at all the things. We encourage each other to give ourselves some grace, we share pictures of messy houses to keep it real, we bare our flaws to remain authentic. But those acts of self-acceptance don’t touch on the expectations of others. When you’re hosting a holiday and are expected to make every food exactly how it’s made at someone else’s house, keep up with everyone’s specific diet and what they can or can’t eat this week. When you have to plan it all to come out at a specific time so it fits everyone else’s schedule. When it’s all on you to plan, shop, prep, cook, time, and serve the meals exactly as everyone else insists they need it… and they’re annoyed because you need an extra 10 minutes after they get here to finish baking a side. When you’re the one coordinating everyone to begin with – texting, calling, emailing, begging, praying, hoping it will all work out and everyone can come. Running the calendar to find a day and time that will work for 5 different schedules, and they get annoyed when you keep asking them to respond so you’ll have a better idea of just when this circus can even go down. When a kid forgets a lunchbox, a change of clothes for PE, a water bottle, an assignment – they get annoyed at mom. Either mom didn’t remind them to take it that morning or mom didn’t bring it fast enough or – dare say – mom was too busy doing something else to rush it up there at all. When a kid falls behind on an assignment, the mom is the bad guy who either let him fail or who nags him to catch back up. When dinner isn’t planned, mom is the flake who dropped the ball. When your family arrives late to a function, it’s mom who gets blamed, it’s mom who they’re mad at (even though it was THEM who wouldn’t wake up when MOM gently started rubbing their back that morning, telling them it was time to get up). When there are practices, therapies, appointments, lessons, classes, dates, parties, games, recitals, due dates, lunch dates, release dates, deadlines, budgets, emails, meetings, IEPs, 504s, evaluations, explanations, park days, snow days, half days, bad days… we’re the ones who are supposed to have it all under control, running smoothly, always on time with nary a forgotten sheet of paper. Our families – they’re really freaking hard on us. Really hard. Sure, we’re the glue that holds it all together, but then who gets the blame when something falls off? Us. Mom. The glue. The lady who has spent the day feeling like she’s falling behind. The lady who stayed up late and woke up early to make sure nothing was missed. The lady who told herself it was okay when something was missed. The lady who hears all the other moms saying it’s okay to be imperfect, then comes home to a house full, an office full, or a whole network full of people who demand otherwise. When I serve a favorite meal for dinner it’s not half as passionately received as when I serve a meal with tomatoes. When there are clean clothes hanging it’s eerily silent, especially compared to when there are no jeans to be found anywhere (spoiler: they’re shoved in a corner under the bed). Don’t even get me started on when I try to pick an outfit out beforehand to streamline the process – no one EVER wants to wear what I select, yet they all strangely need my help when I tell them to do it on their own. “Everyone is always mad at you.” And they are. We work on gratitude and manners here, it’s not like my kids are barking hellions who sit on thrones and demand compliance from me. Their grades are their grades and their responsibilities are their responsibilities and this is not a restaurant so they’ll eat what’s placed in front of them. But my consistency and firmness and expectation that I be treated with respect doesn’t stop them from somehow expecting more. Much more. Too much more. It doesn’t stop strangers from judging the mother whose child is experiencing a meltdown. It doesn’t stop teachers from rolling their eyes at the mother who is trying to advocate for her child. It doesn’t stop everyone, everywhere, from demanding and expecting just too dang much from us. I’ve seen a quote floating around a lot lately and cannot shake the truth to it: “We expect women to work as if they don’t have children, and raise children as if they don’t work.” It’s so true, but it’s also just the surface of the very deeply-rooted problem. As we get older, as we become mothers, the baton begins to come our way and we start taking over the responsibilities of traditions, holidays, gifts, reunions. We’re supposed to keep everyone in touch – even though no one wants to stay in touch. We’re supposed to plan it all, remember it all, execute it all. Birthdays and anniversaries and cards and parties and laundry and allergies and dinner and lunch-packing and field trips and doctor’s appointments and grocery shopping and friends who really want to hang out and phone calls at the most inconvenient times. Note that I still haven’t even factored in mom’s possible work or any thought of hobbies. The weight of a family falls upon the matriarch, and little thought or appreciation is extended towards her as she sweats to hold it all up. Attention is paid to what is dropped, not what is maintained. Everyone is mad at you. And you are just really trying your freaking best. Everyone expects a lot, and honestly, you do a lot. Like the episode of Friends when Monica didn’t even want to host Thanksgiving but was guilted into it, then guilted into making multiple different kinds of potatoes because everyone wanted theirs to be the way they liked… that’s motherhood. Their expectations will always be greater than our efforts… and we put a LOT of effort in. So what do we do? Will we never please them? Are we doomed to live in a constant state of disappointing those around us? Is everyone always going to be mad at us? But I do know that I can say “NO”, and I need to start practicing. I can advocate for myself while everyone else petitions. They can demand, but I can deny. We can take stock of what we really have to do and what they can just buck up and do themselves. Or we can go on strike and they can just fail their classes and make their own mashed potatoes. Either way, I’m tired of everyone being mad at me. I’m tired of carrying this weight, these expectations. I’m tired of feeling like I’m dropping all the balls. Because honey, if it weren’t for what we moms do, they’d be drowning in a flippin’ ball pit. We are rock stars. We keep this ship afloat. We run the world and pack its lunch. We are the glue, and we’re doing a really, really great job of keeping it all together. You’re right, you ARE a Rock Star! You are an amazing Mom, wife, daughter, and friend! And such an extraordinary individual! So fun and funny and intelligent and gifted in so so many things! Rock on Star!